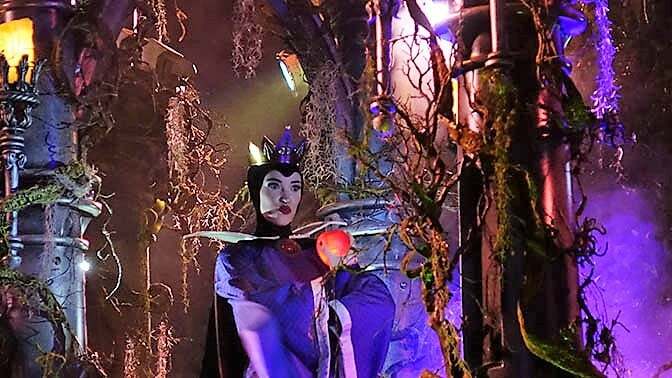 I attended the first Mickey’s Halloween Party for 2017 at Disneyland recently and thought you might enjoy hearing about the experience. 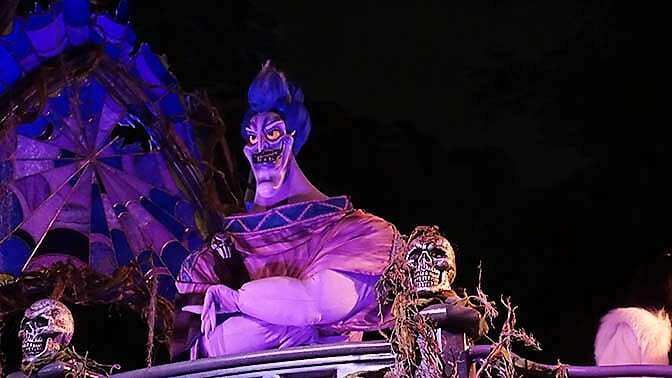 Perhaps it can help you plan your evening and I was able to get some great photos of the villains in their parade. Take a look and let me know what you think! 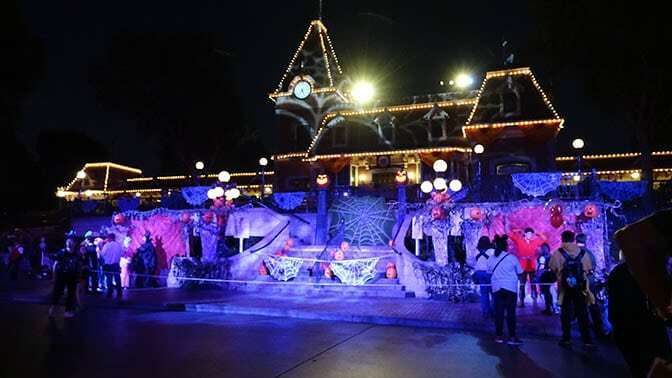 For the last couple of years I was able to pick up my party wristband inside the park at the entrance to Frontierland. 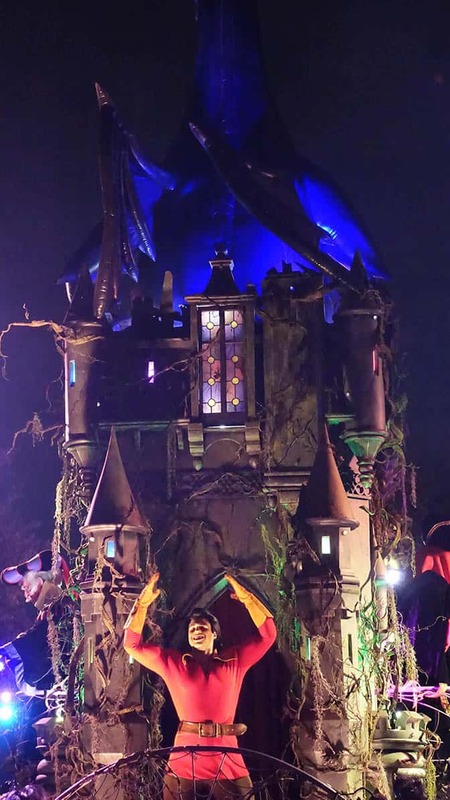 I scurried over there 3 hours before the party began and no one was there to assist. 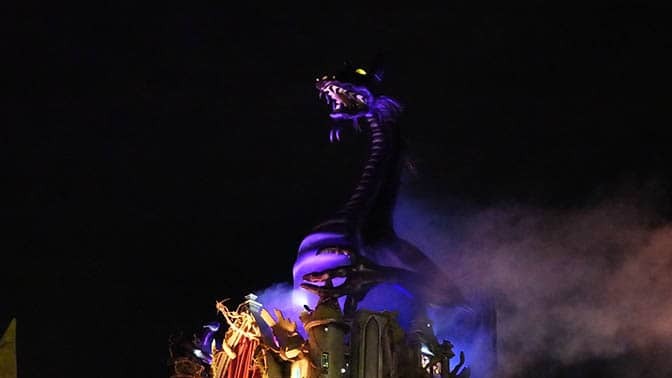 I left the park to re-enter through the main gates. At the main gate I was informed that they are distributing wristbands at the Starcade in Tomorrowland. I found a pretty long line there. 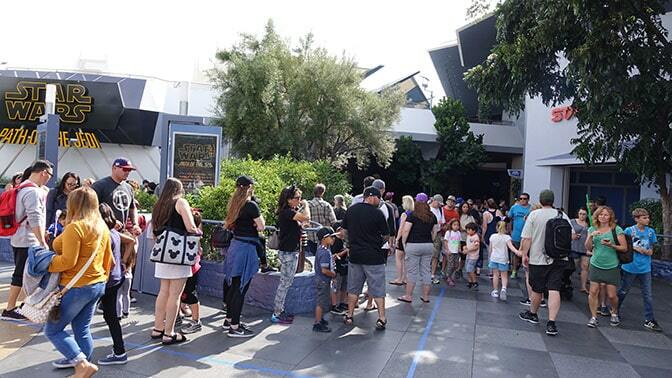 It was actually faster to exit the park and return than to use this line. 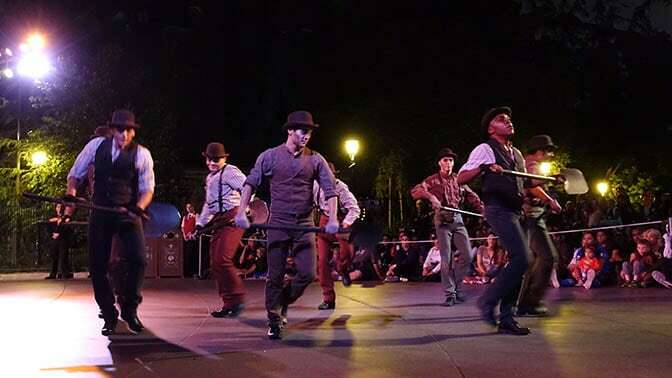 One of the highlights of the Disneyland version is the Toontown Pre-party. The pre-party occurs 1 hour before the party officially begins. If the party begins at 6pm, you can enter at 5pm. If the party begins at 7pm the pre-party begins at 6pm. 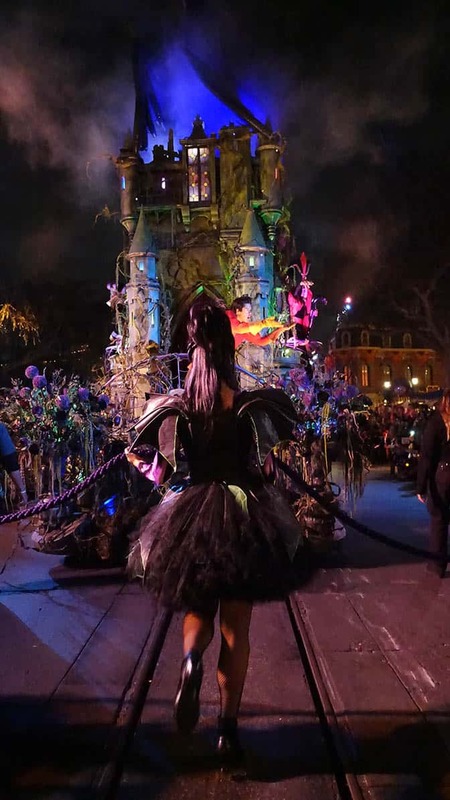 The pre-party allows you to meet some characters in special costumes and pick up some candy before the party officially begins. Line up here in front of it’s a small world TWO hours before the party begins. 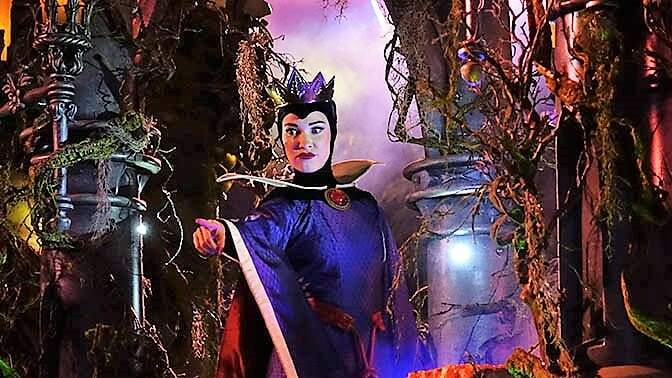 I was among the first to enter and only the 2nd to go straight to the characters. 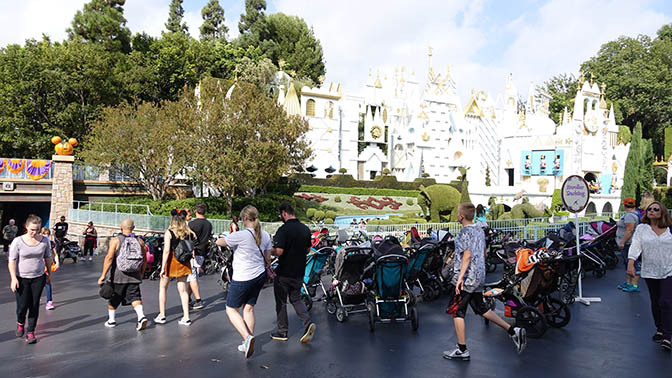 It appears that candy is so valuable that hundreds of people line up early to walk in a circle around the Roger Rabbit Fountain area with a long line. 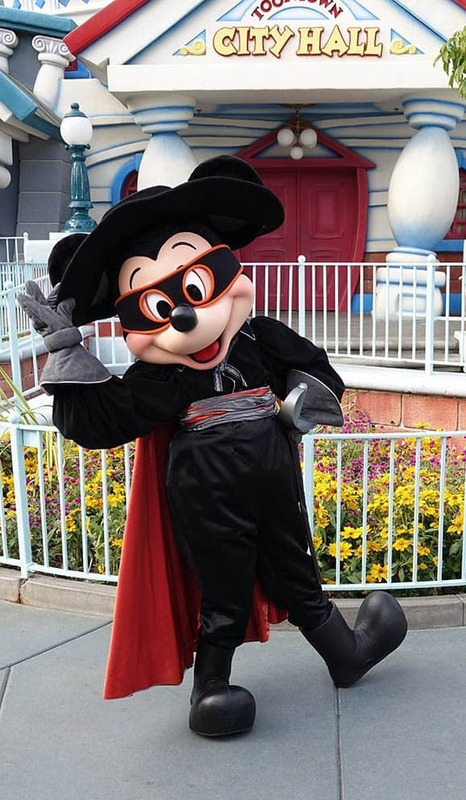 It’s Zorro Mickey again this year. 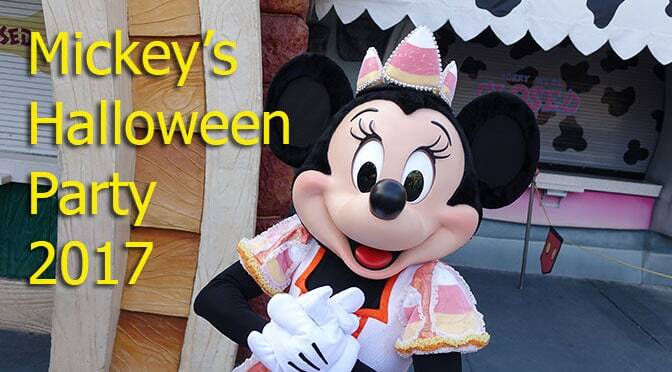 Candy Corn Minnie returned as well. This year they don’t meet together. They meet near one another at the same time. 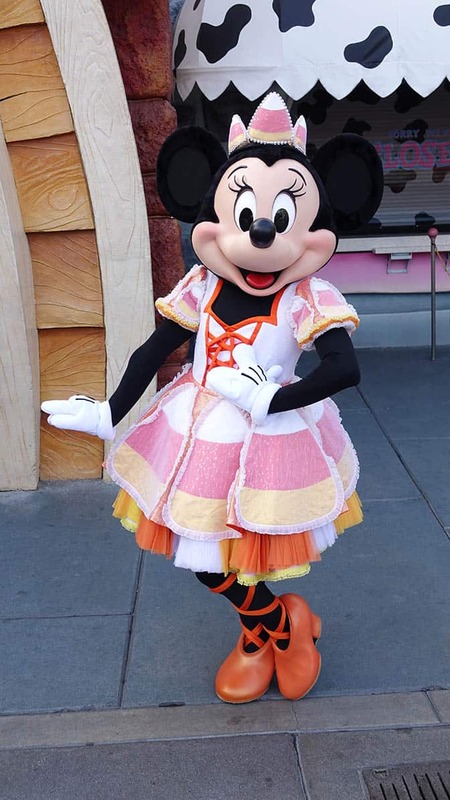 After meeting Minnie, I had time to burn before seeing what other characters would appear. 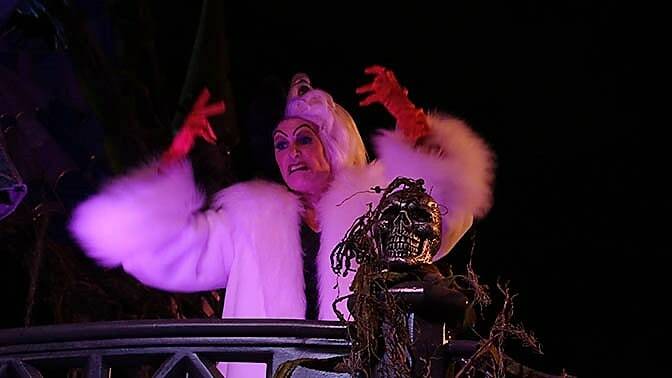 I made my way through the Donald’s Boat and Minnie’s House candy lines. By the time I finished those, I had over a half bag of candy. 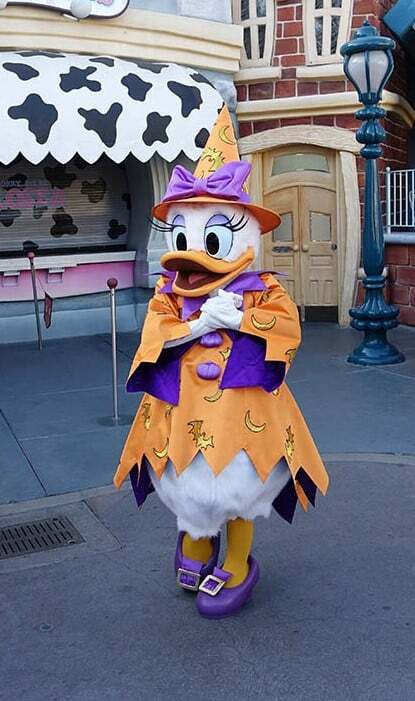 I then returned to find that Daisy and Donald were in the same costumes as last year. 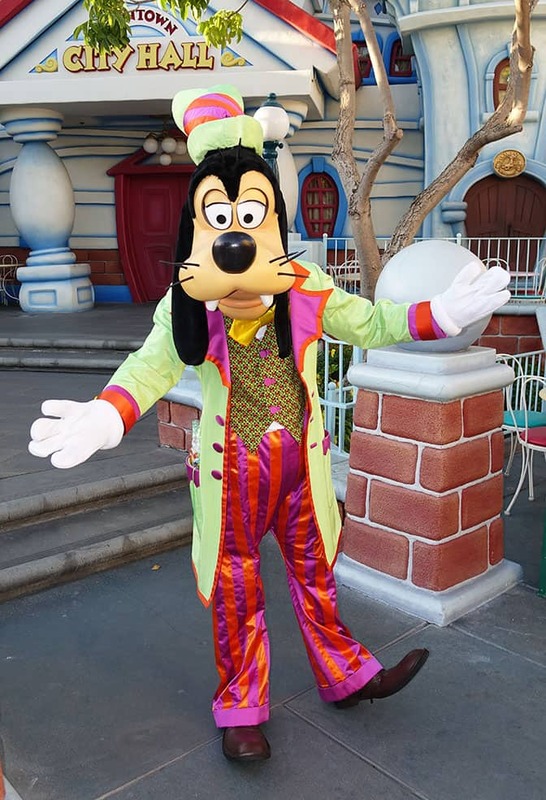 Goofy is dressed the same as last year as well. 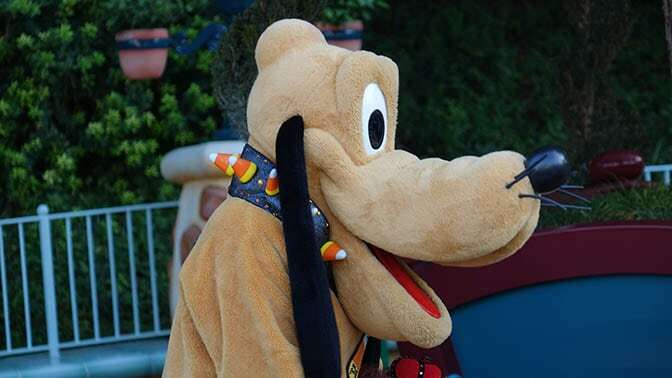 Pluto is wearing the same collar as 2016, but now meets in the little garden area. 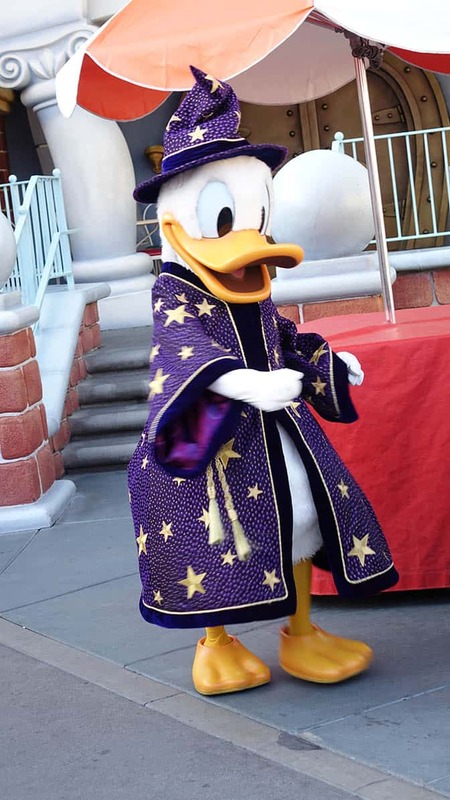 I liked the way it was done last year with Mickey/Minnie and Donald/Daisy meeting together. 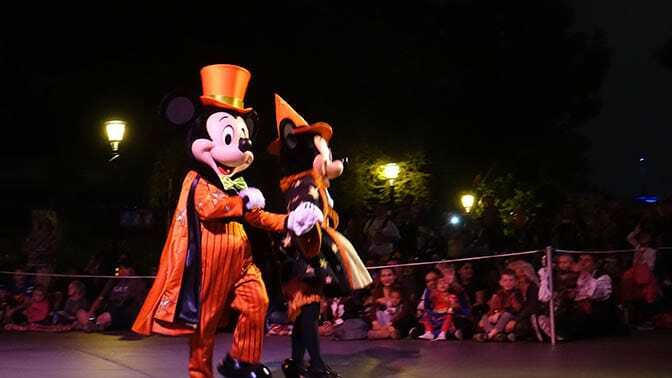 Pumpkin characters returned to greet you again in Toontown again for Mickey’s Halloween 2017. 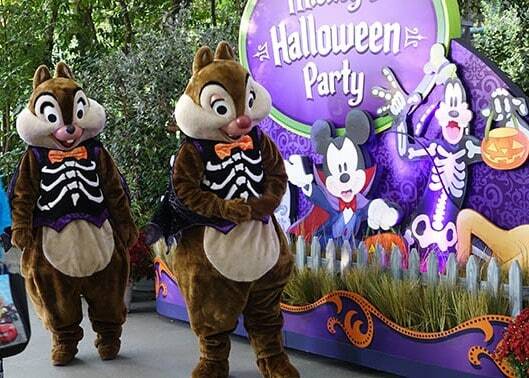 If I hadn’t asked a Cast Member where Chip and Dale were, I wouldn’t have had a clue. 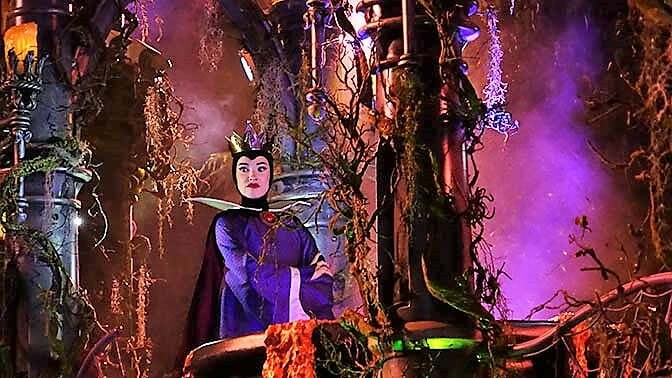 The Disneyland Halloween Party map is a mess. I’ve added them to my own map on Character Locator to make it easy to find them and all the other characters. 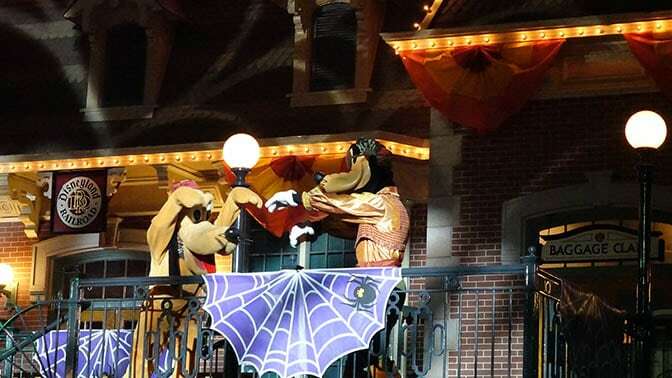 I briefly saw Horace and Clarabelle too, but when I returned later, I found that the entire meet had closed. It had VERY limited hours. 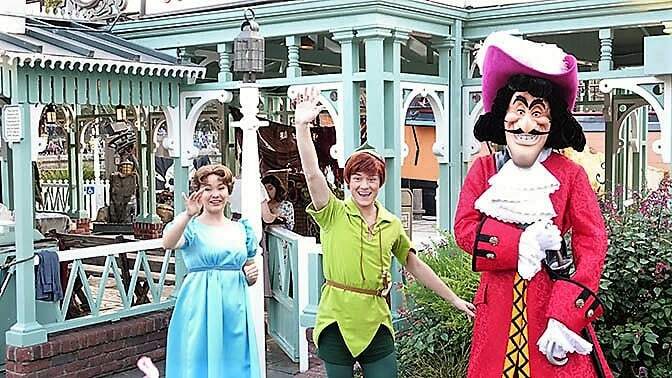 Peter Pan, Wendy and Hook return for “Pirate Palooza” for 2017. I was disappointed to find that the El Zocalo area with Chip n Dale, Pluto and Goofy as pirates didn’t exist. The only thing I saw there was a long line for candy. 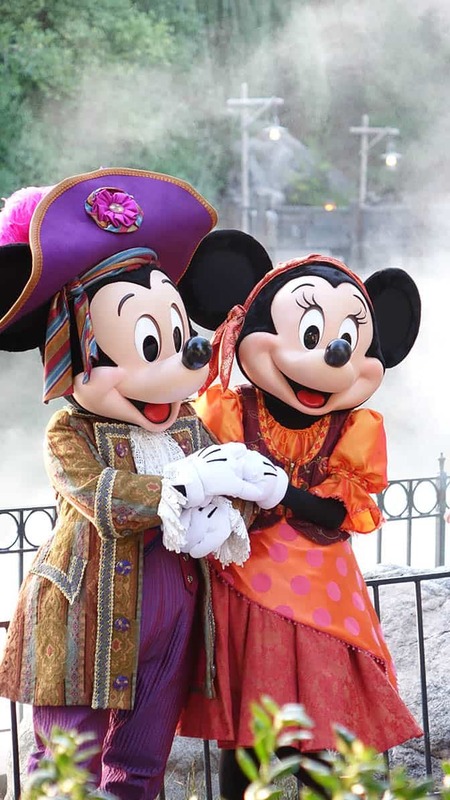 Mickey and Minnie joined the pirate fest. When the party first began, they were in front of the petrified tree, but moved to the boat dock shortly after due to all the fog ruining photos. Captain Jack Sparrow was supposed to meet, but I never saw him. 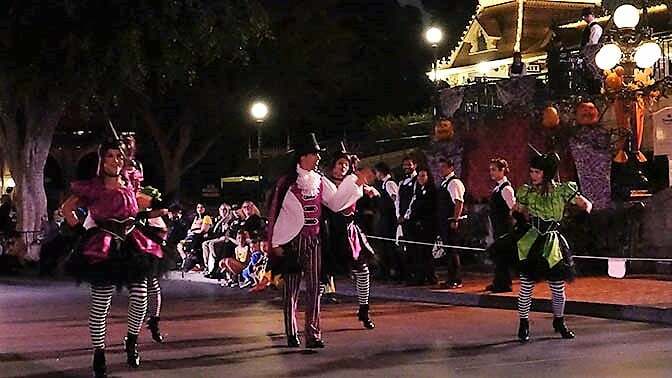 Annual Passholders are no longer given a gift during the Halloween Party. 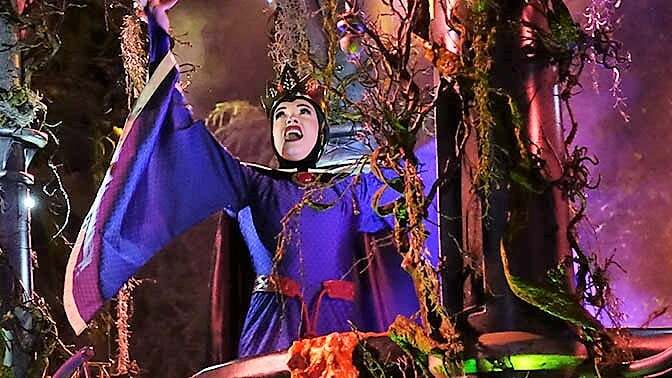 Instead, they are offered a digital download photo along the Rivers of America. 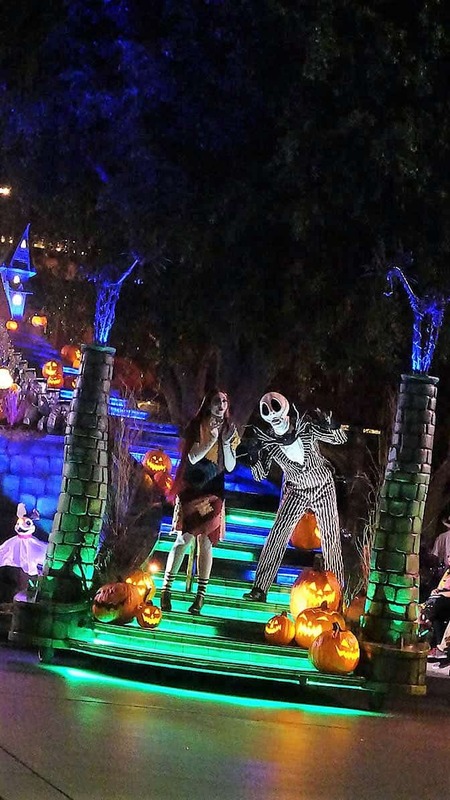 I was told that the AP Magic Shot is supposed to add Jack and Sally to the photo. The line was ENORMOUS, so I skipped it. 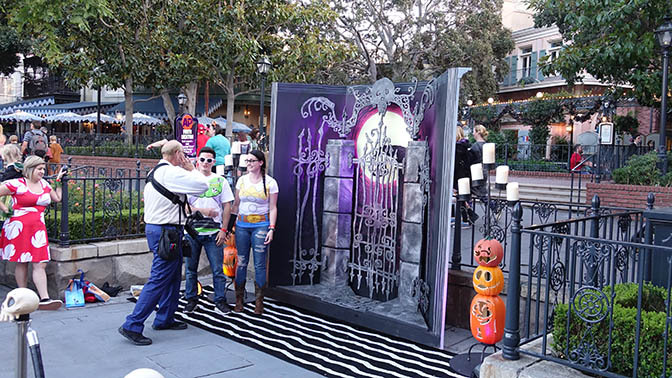 I’ve met the real Jack and Sally many times and wanted to do more than stand in a photo line for an hour. 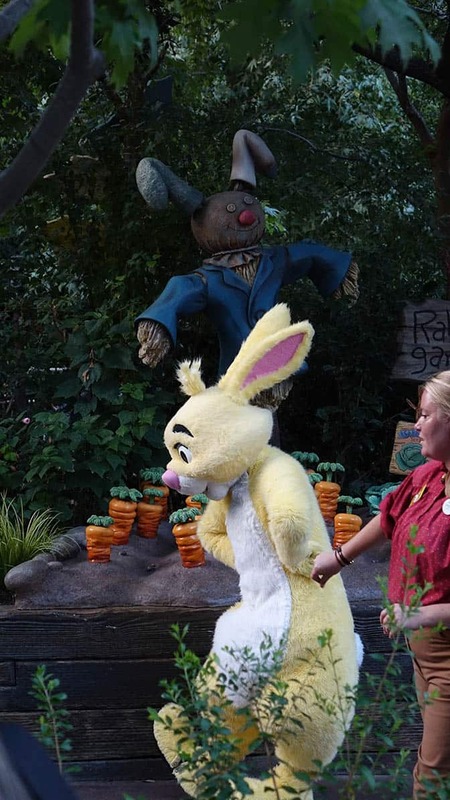 Rabbit is meeting during Mickey’s Halloween Party this year, but has a specific schedule that I provide for you on Character Locator as well. 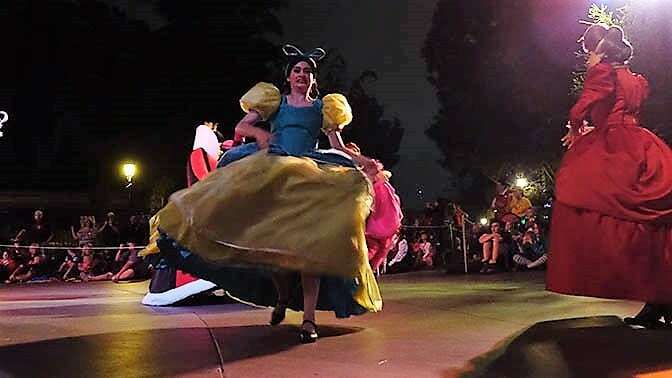 Winnie the Pooh is a Bumble Bee again, but Eeyore and Tigger still haven’t found a costume for the party. 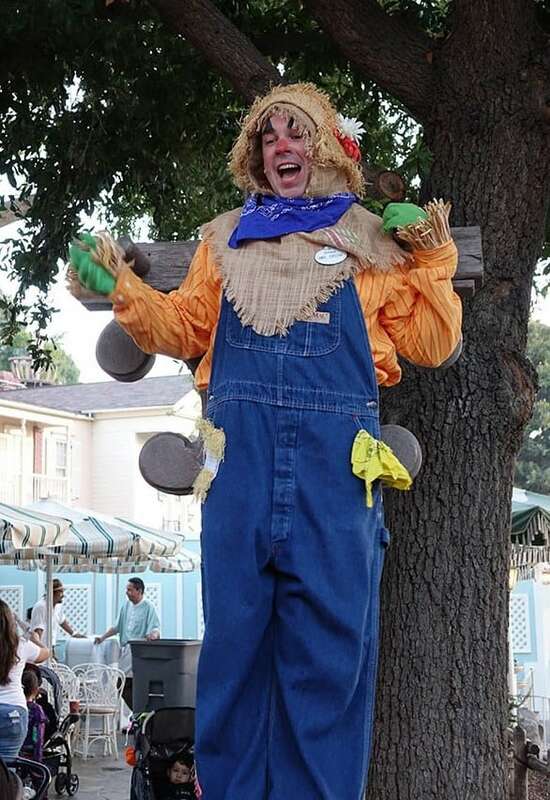 The Frontierland Scarecrows are always a delight. They joke with passing guests from their various perches. 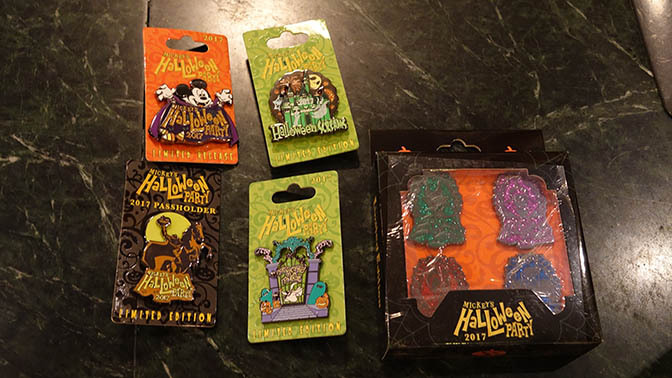 Here’s some of the pins that are for sale. I found these in the Emporium. 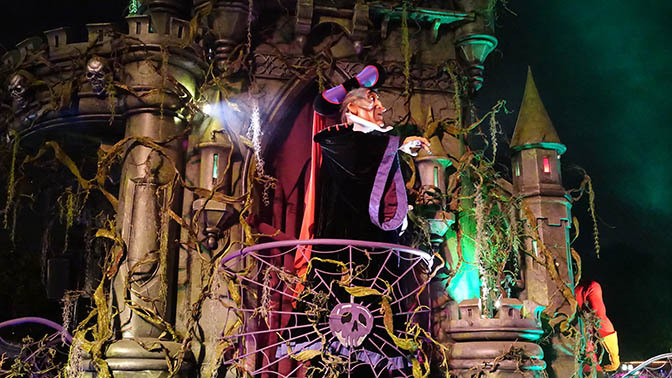 The highlight of Mickey’s Halloween Party is usually the villain meets. 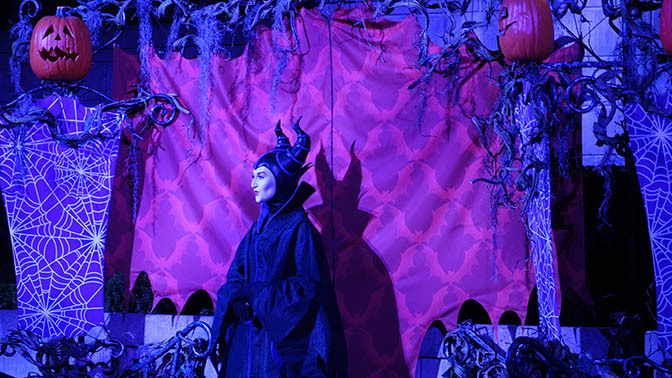 They cut this back a great deal last year, eliminating Hades and Gov Ratcliffe, but many really love meeting Maleficent. 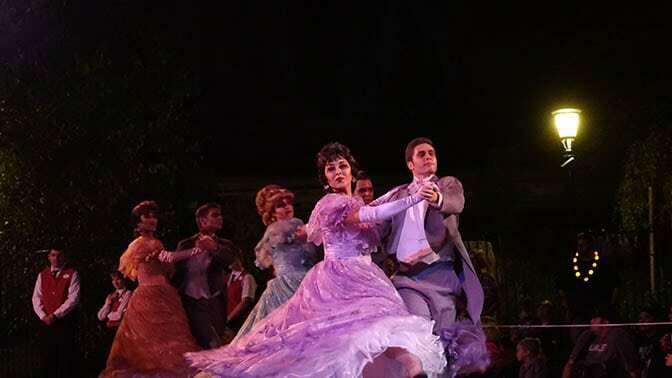 Gaston and Dr. Faciler rotated. 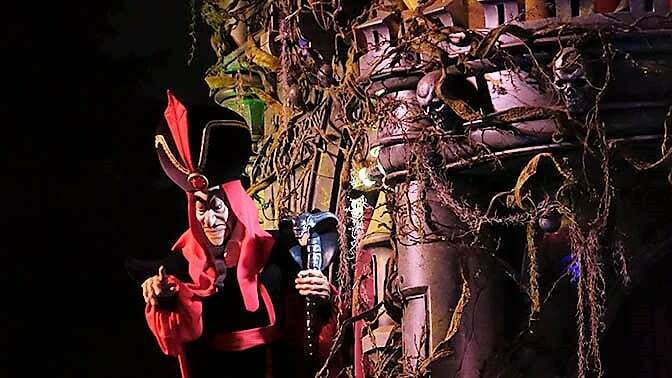 It was funny hearing people say “No!” when the Shadowman arrived. 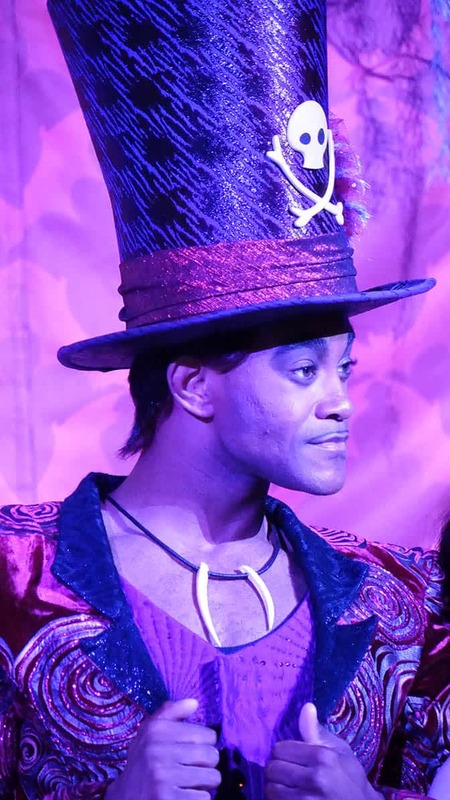 Gaston is a real hoot and people love meeting him and hearing him talk about how great he is. 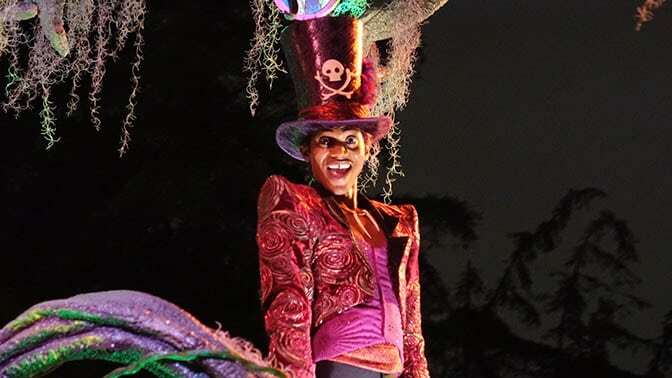 Dr. Facilier seemed unfazed by it all. 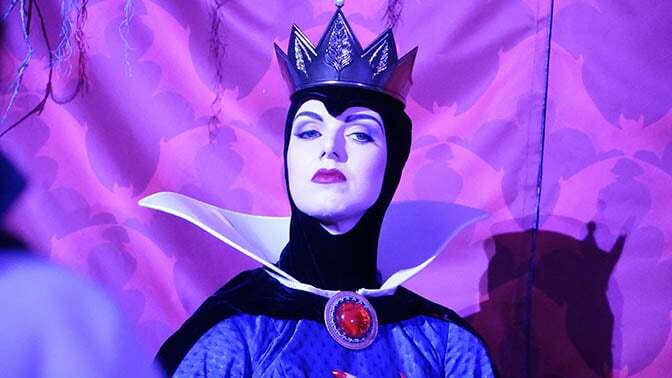 The Queen rotated with Malificent. 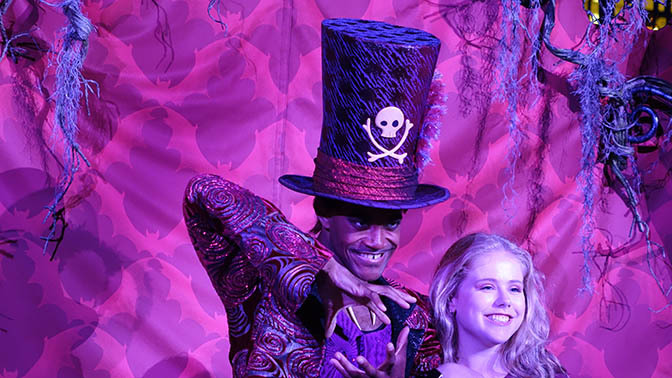 At Disneyland you can find her and Dr. Facilier out most days during the daytime. 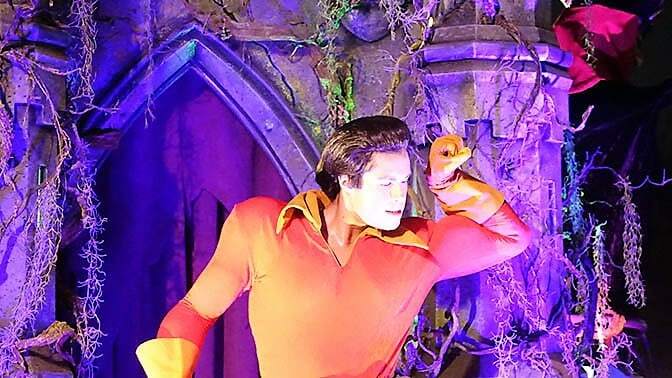 Gaston sometimes wanders through Fantasyland, but doesn’t have a set schedule. 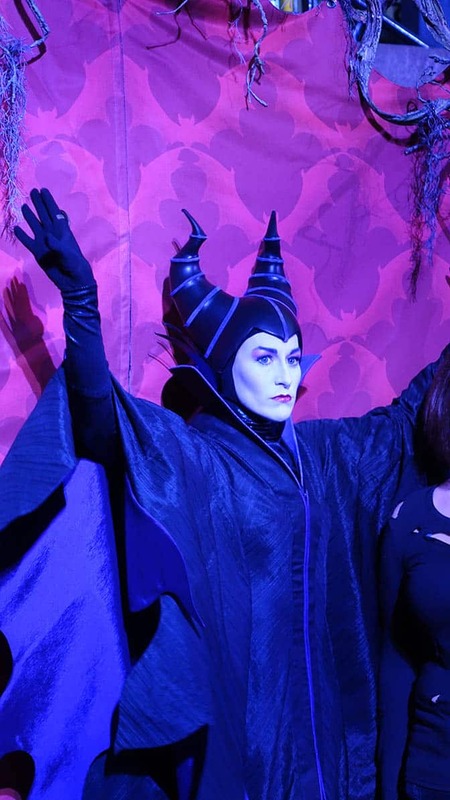 That’s one reason why Maleficent was so popular. 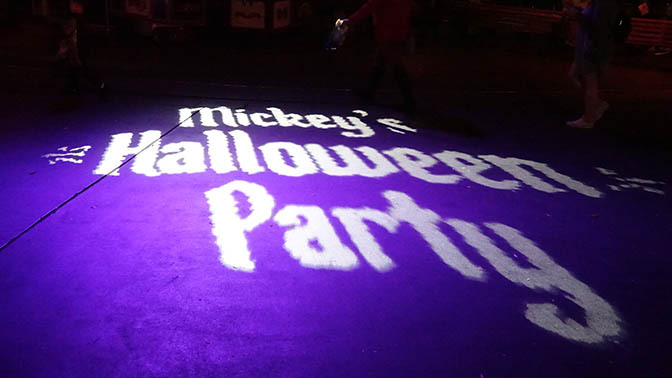 Part of the fun of Disney parties is the projections you find on the ground and buildings. 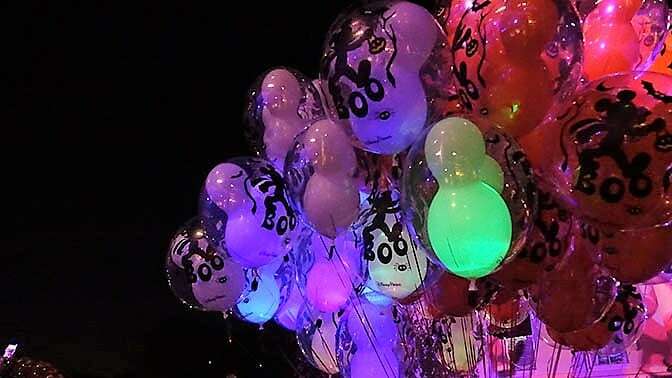 People seem to like the Mickey shaped balloons that say Boo! on them. 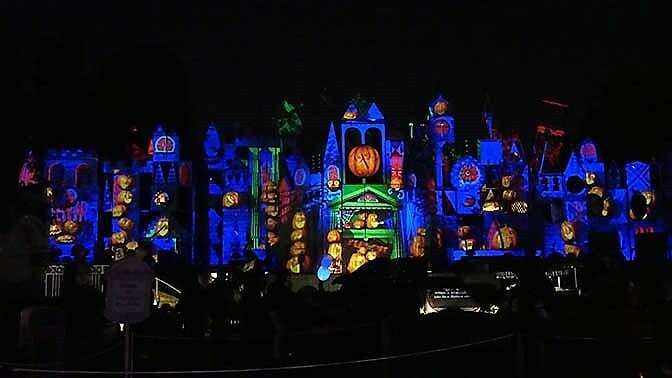 The Castle offers projections as well. 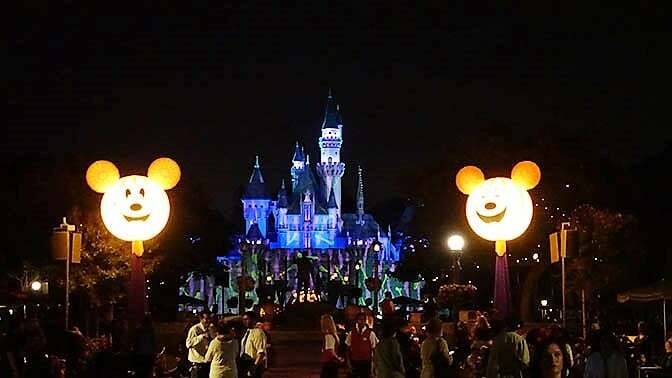 It’s odd seeing the Disneyland castle for the first time because it’s much shorter than Cinderella Castle in Walt Disney World. 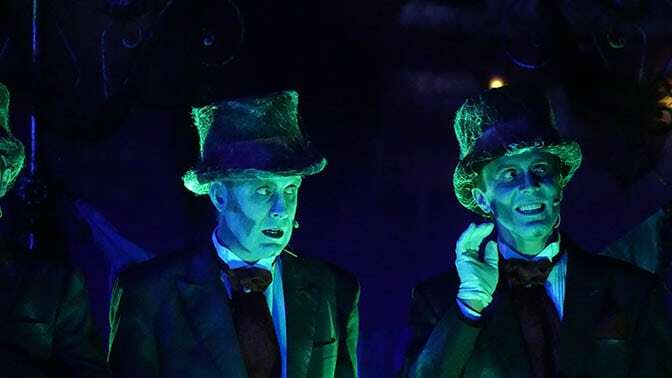 The Cadaver Dans are great entertainment on both coasts. 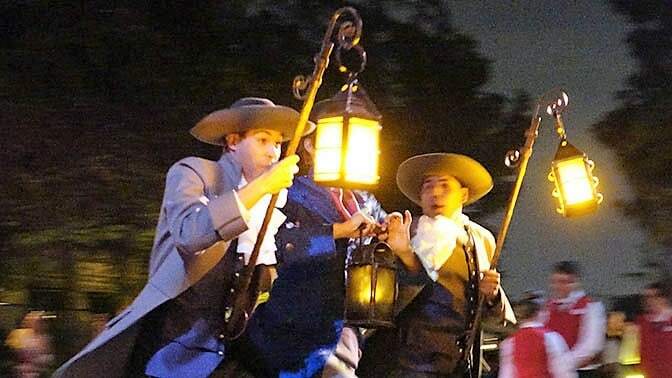 In Disneyland they are dressed as cobwebbed butlers and they appear on a raft upon the Rivers of America. 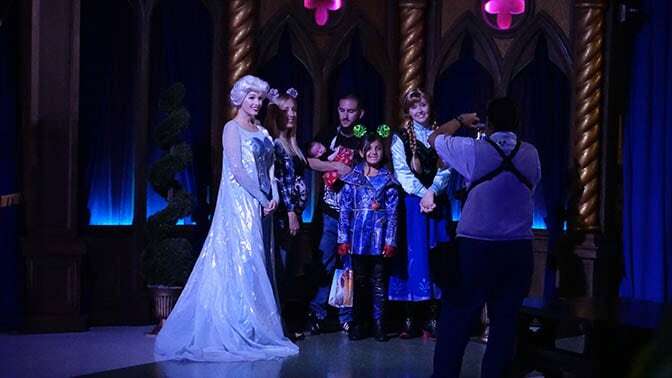 I found Anna and Elsa out for meet and greets along with Cinderella and Snow White. 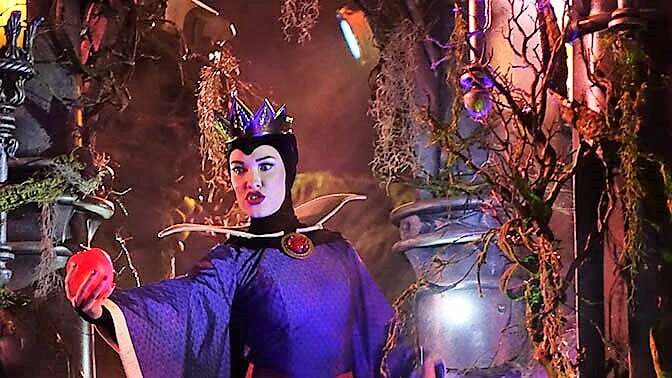 They weren’t mentioned in any of the Disney official information. 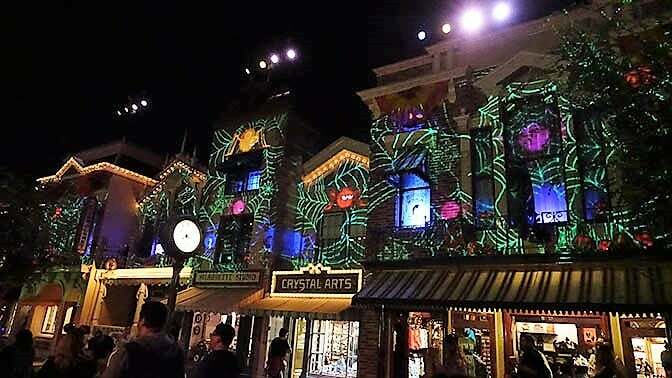 During Halloween Parties, it’s easier to watch fireworks on Main Street. There are fewer people, so you’re not quite as cramped. One alternative for those who don’t like crowds, is watching the fireworks from it’s a small world. 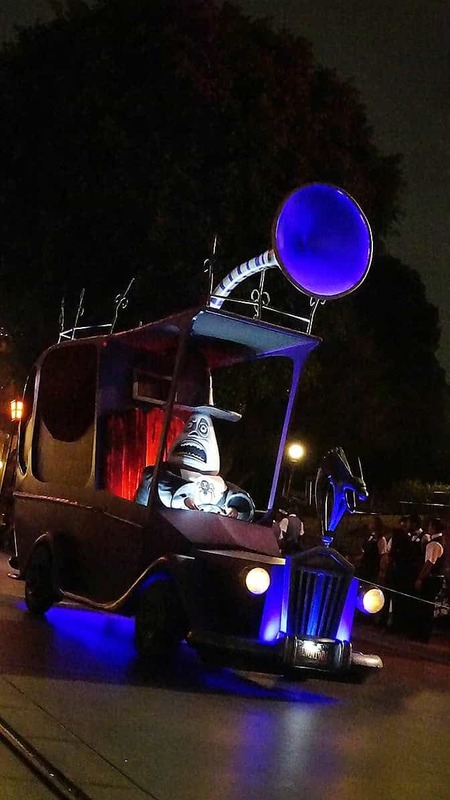 Disneyland’s Frightfully Fun parade is much shorter than its Disney World counterpart, but has some fun and unique elements that Disney World doesn’t offer. 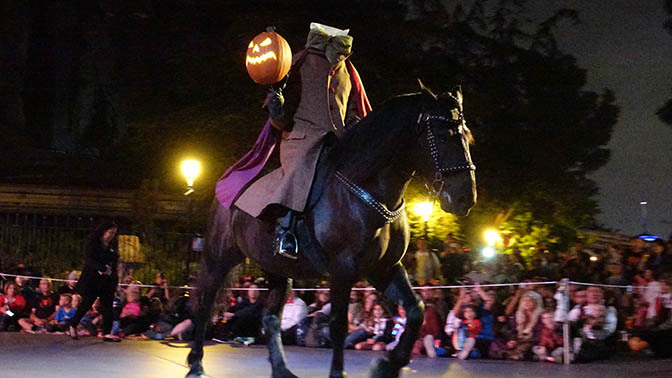 For example, Ichabod Crane appears to lead the parade right before the Headless Horseman. Clip, clop. Clip, clop. Clip, clop. I wanted you to feel like you’re actually there! 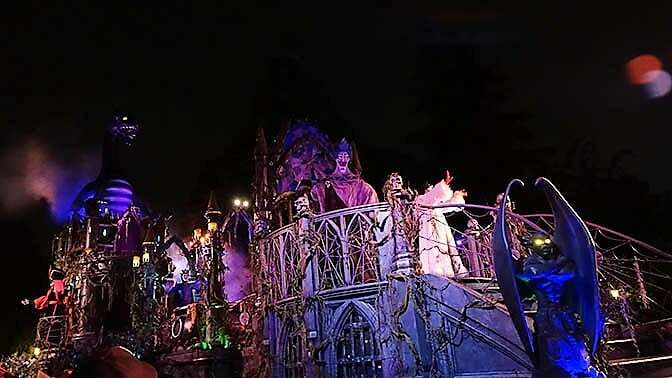 Float to begin the parade. 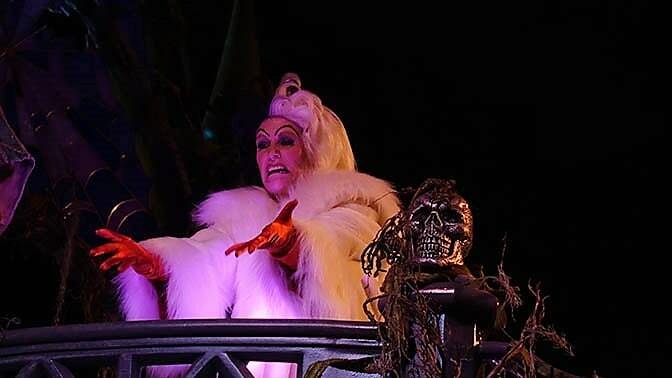 Let me say that if you want to see the first parade, you may need to find a decent spot 45-60 minutes early. 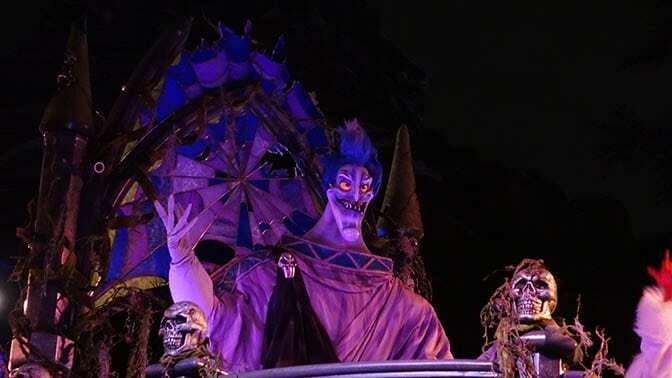 The second parade didn’t require much effort 15-20 minutes early. 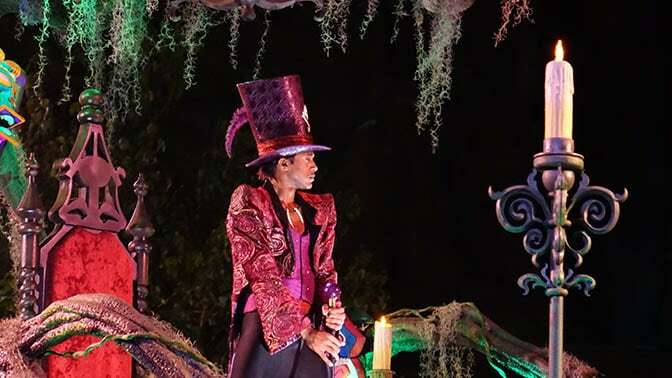 I watched the first parade near Pixie Hollow and second parade on a bench in Town Square. 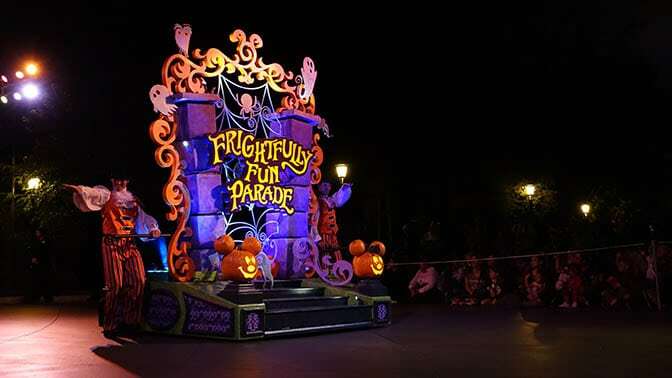 Mickey and Minnie follow the first float. 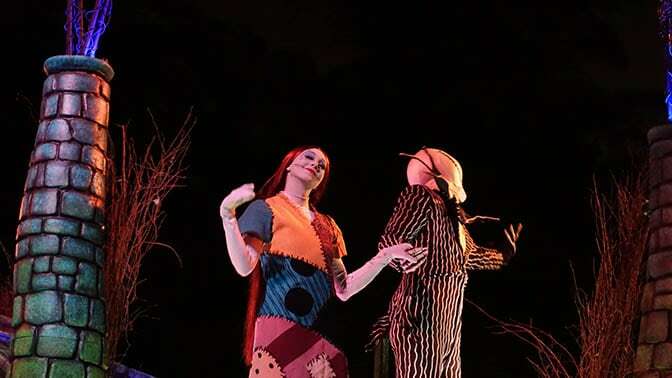 The next set of characters are from the Nightmare Before Christmas. 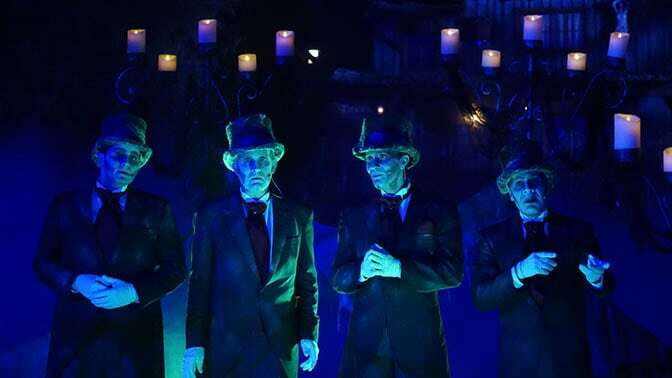 This is a popular group in California as the Haunted Mansion Holiday is an overlay that features them. 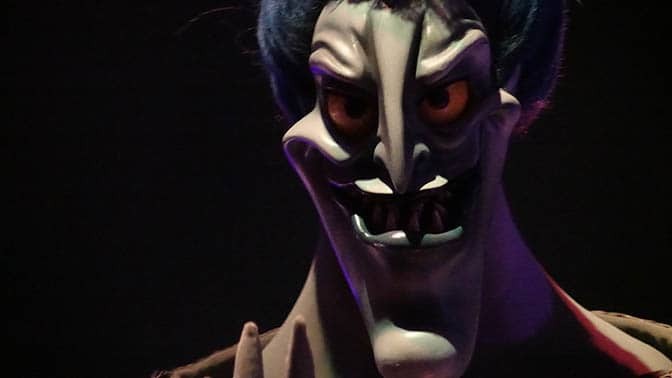 I vant to drink from your poison apple mug! 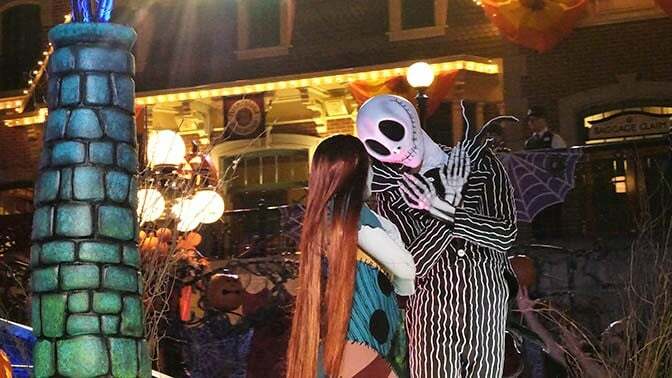 Jack and Sally are always willing to share their undying love. 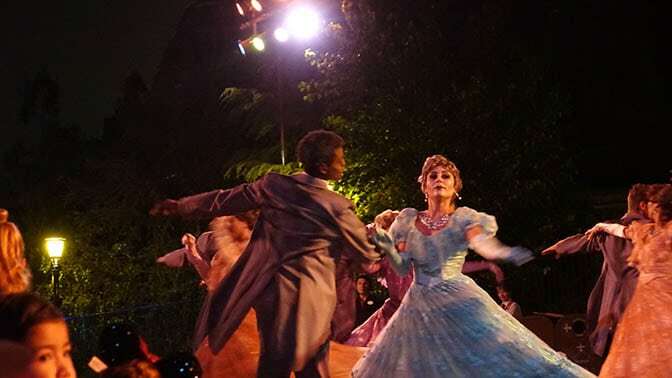 Following them is a group of ghostly dancers. 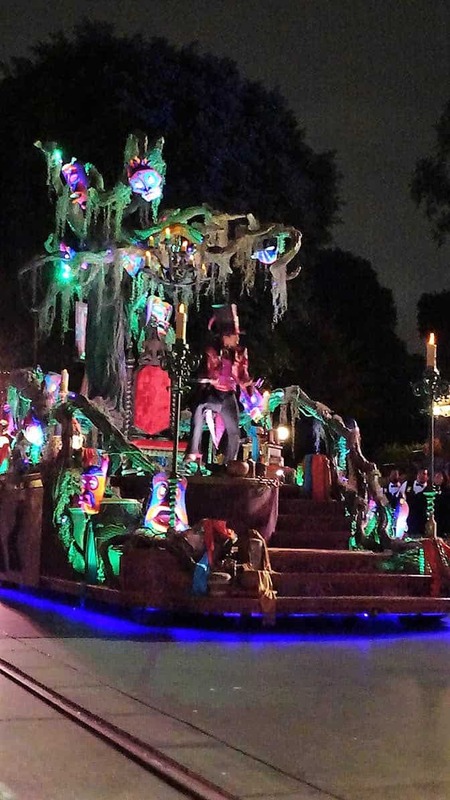 Next up is the Haunted Mansion float. 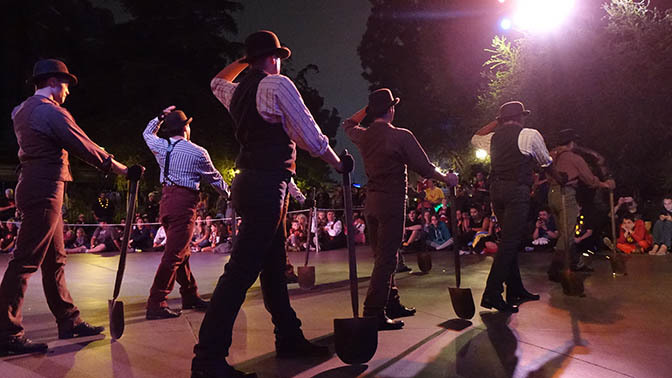 You can’t have a Halloween Party without some grave diggers. I’ve always wondered why they are always digging on pavement. Seems like a dirt area would be easier and more productive? 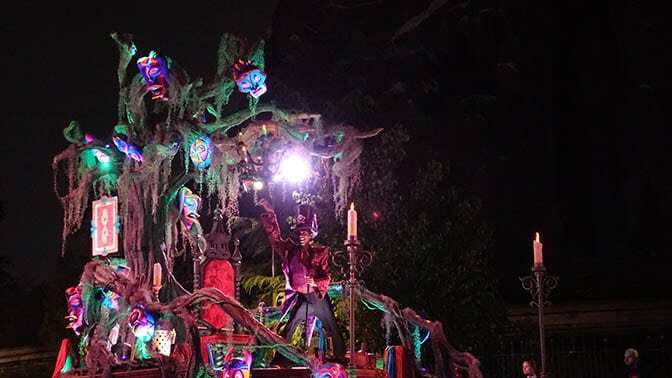 Following them is the Shadowman’s float. 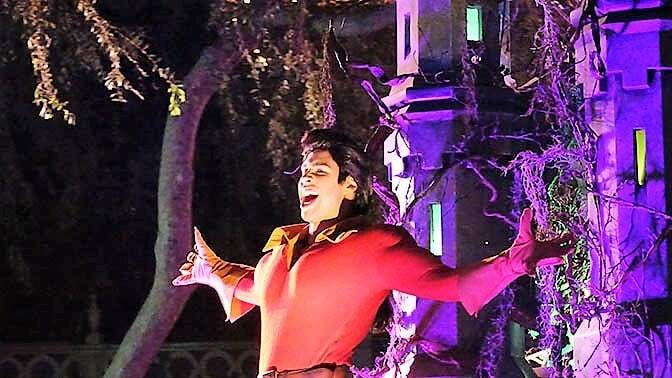 I laugh at your love for Gaston! Ha! 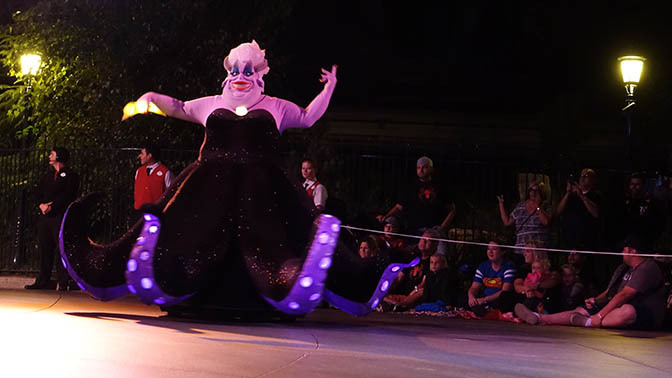 The final group is the Disney villains, which is led by the Sea Witch herself. 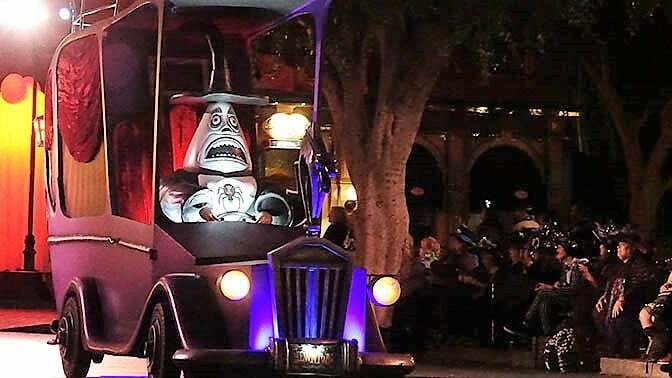 The villains received a new float for 2017. 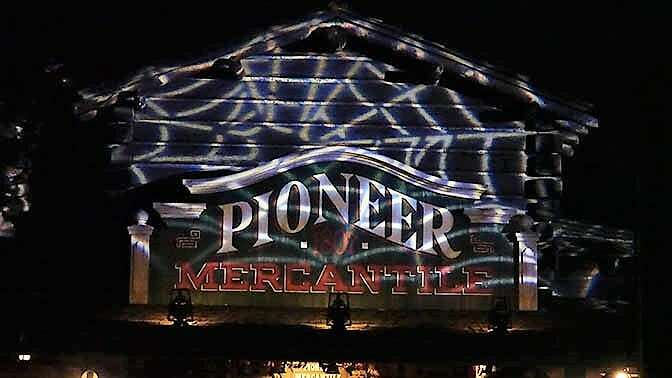 Pretty spiffy! 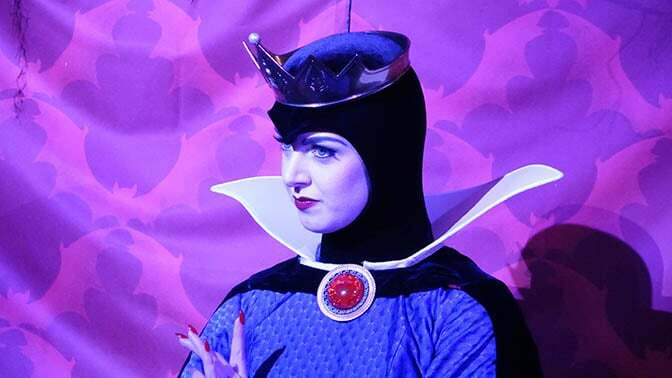 I’m not amused by your photos or poor attempt at witty comments. 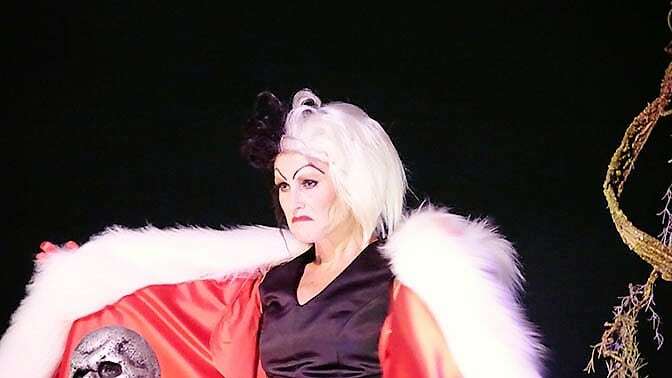 Cruella De Vil is also on the front of the float. 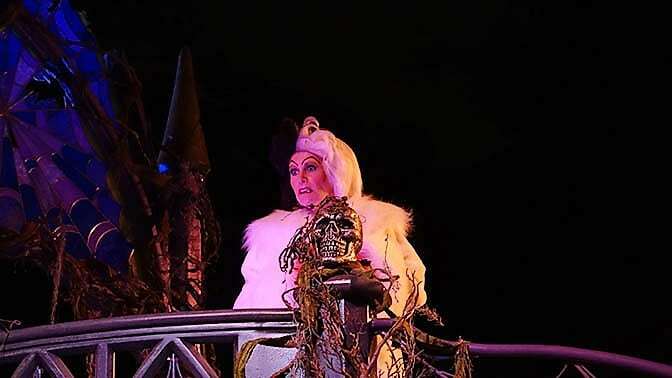 She is always in search of a good deal on some fur. If you wear something with spots, you’ll draw her attention quickly. 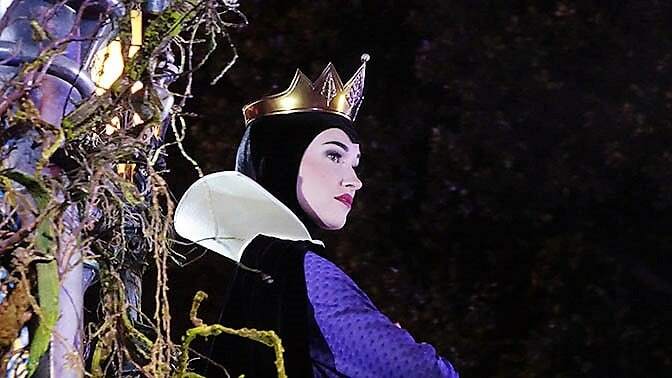 What do you mean you’re sold out of Rose Gold Minnie Mouse ears??? Eh, I don’t need them. 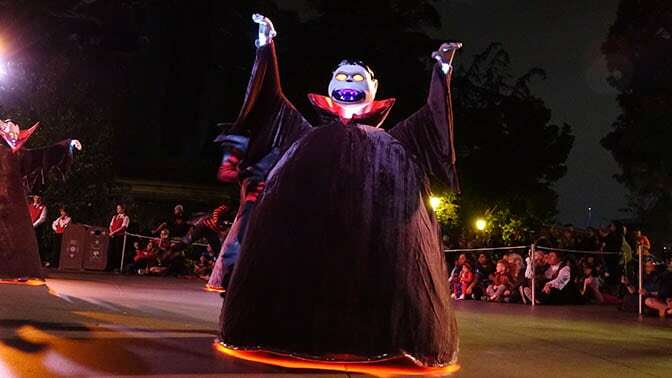 I have an Oogie Boogie popcorn bucket! 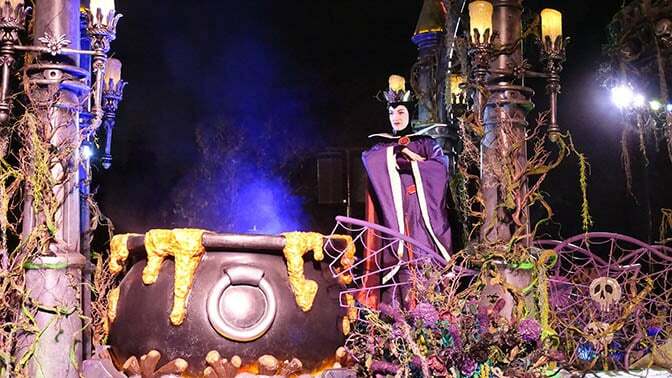 The Queen is in the center of the float, complete with her cauldron. 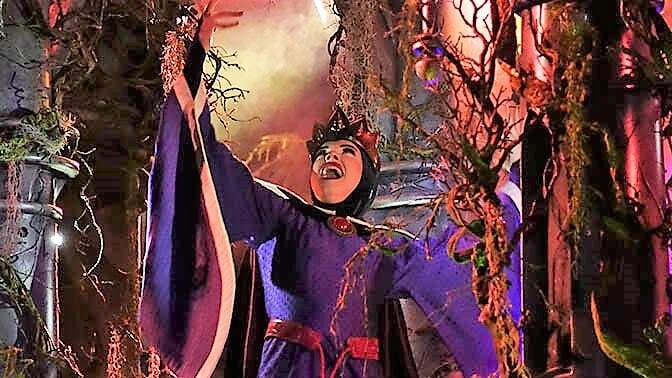 She always seems so happy during Halloween Time. You, turn off that flash! 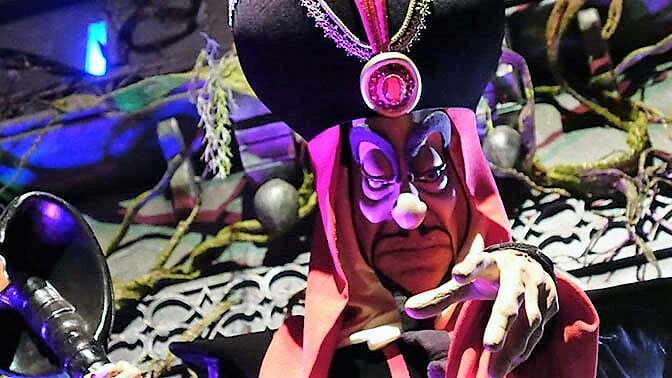 Oops Jafar noticed me in my everyday tourist costume. 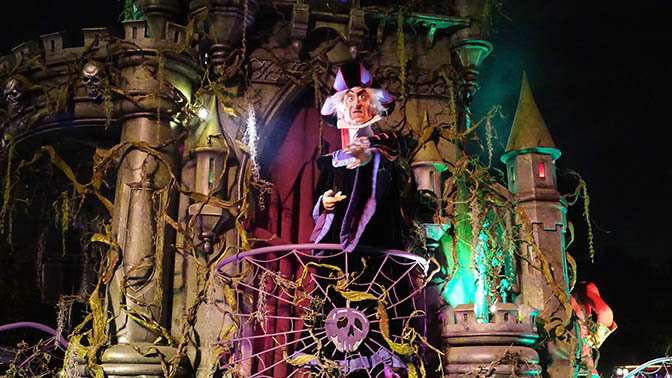 On the opposite side of the float is Judge Claude Frollo. 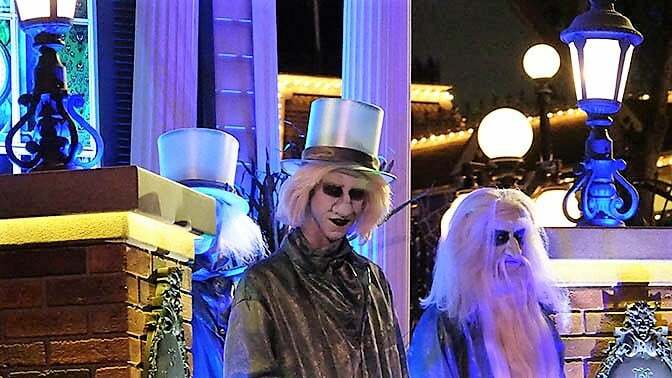 I’d say 95% of guests have no idea who he is. 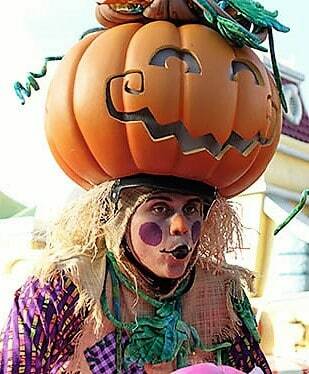 He used to walk around in the Magic Kingdom during the Halloween Party and had very few people wanting photos because they hadn’t seen his movie. 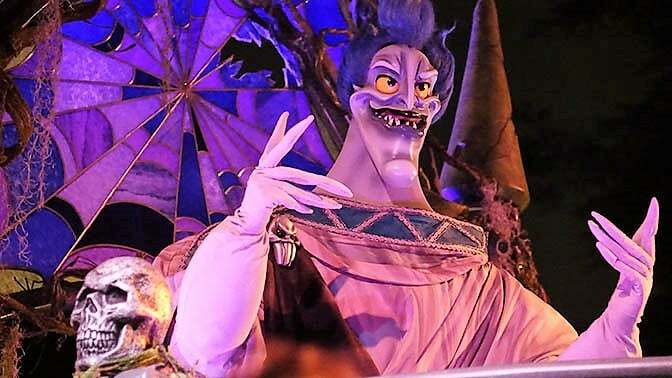 The backside of the villains float offers Gaston, who is always preening for the camera. 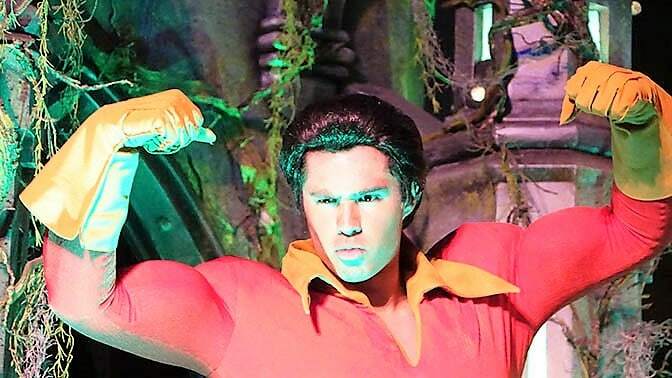 Real men only wear shoulder pads during a football game Gaston! 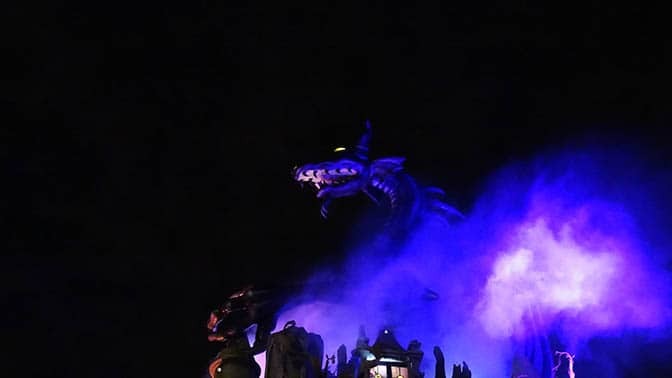 The dragon on the float is pretty cool. 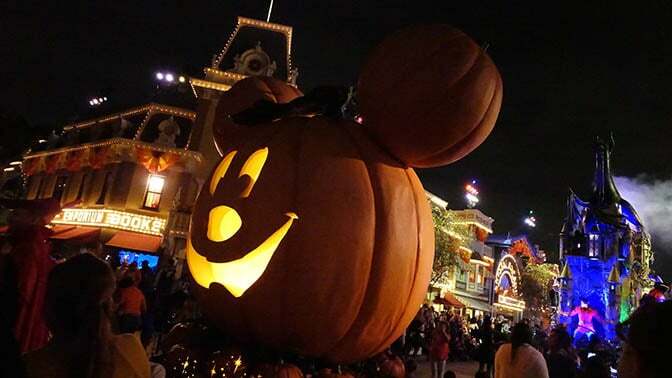 This giant pumpkin in Town Square is extremely popular. 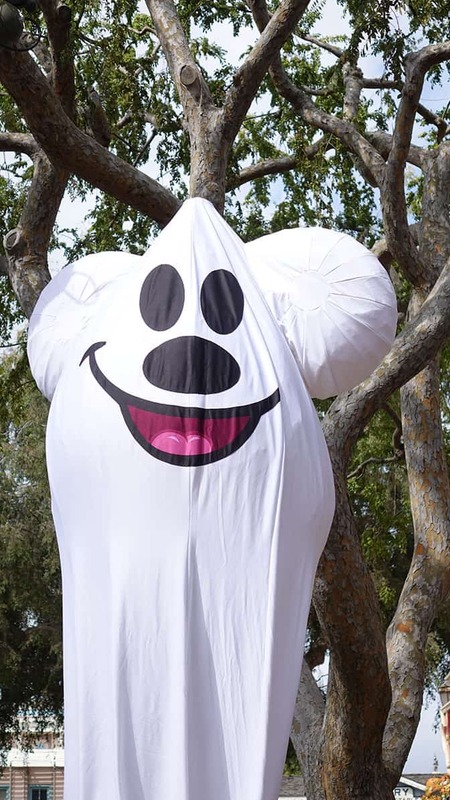 As soon as the parade passed, people began lining up to have their photos taken with the Mickey pumpkin. 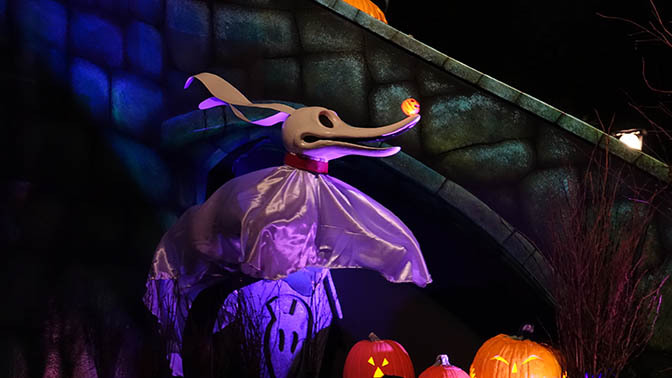 You can find all the character schedules, show schedules, rides that operate, dining locations and trick or treat trails on Character Locator! 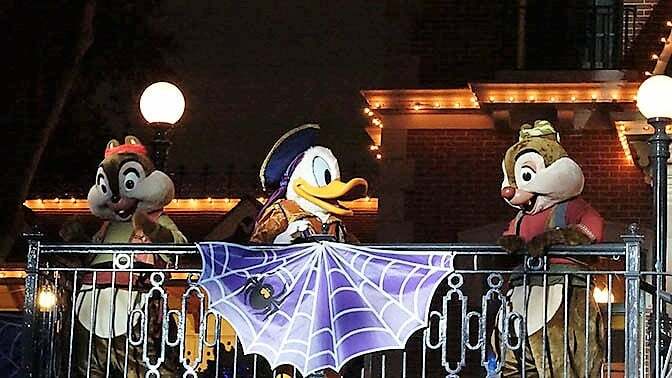 I hope you enjoy Mickey’s Halloween Party for 2017. 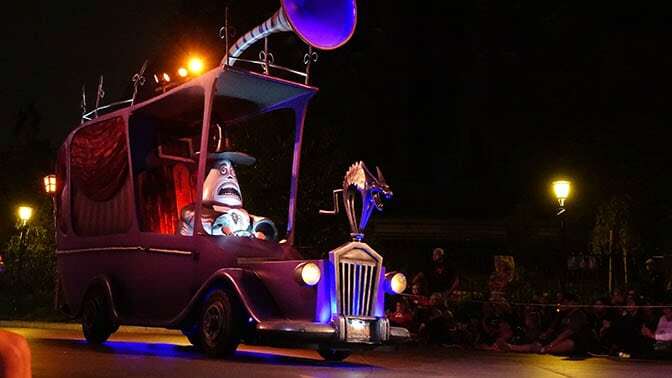 Glad I invested in 2 MNSSHP’s this year at WDW then :) I’m excited to use Character Locator for our party night touring! 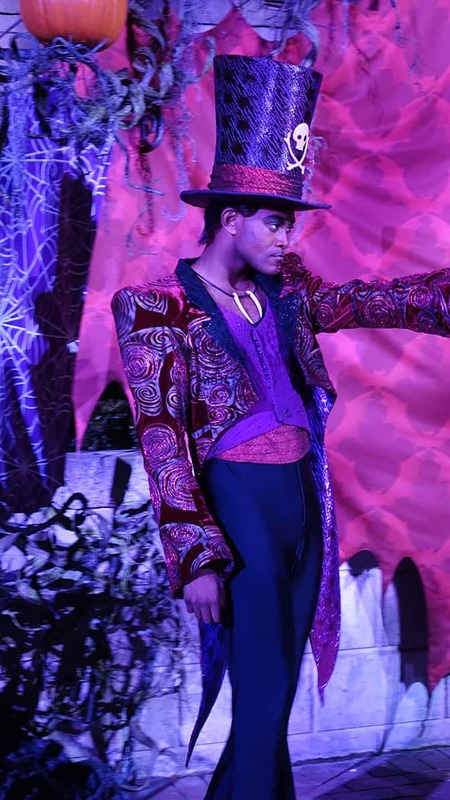 Thanks for sharing your post and the great photos! 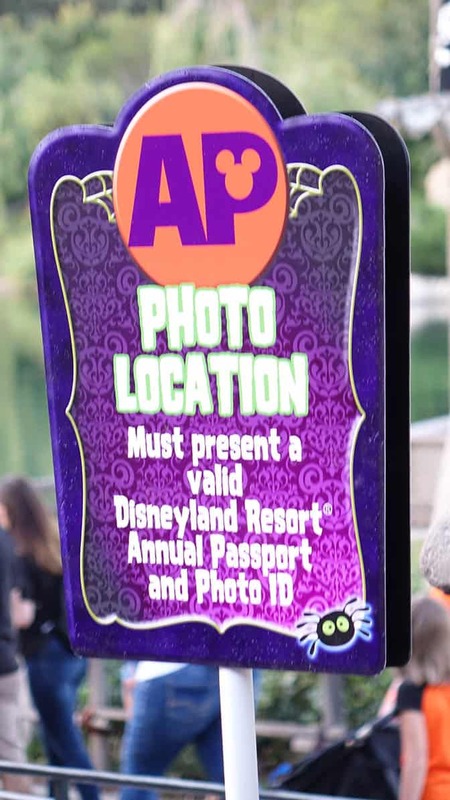 BTW, the AP special photo opportunity was a Magic Shot with Zero. 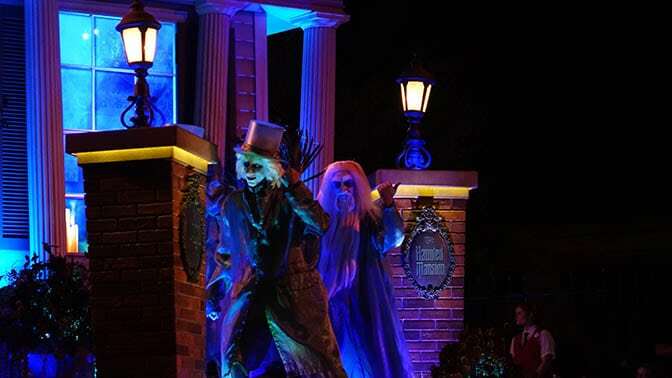 But only Disneyland and Tokyo Disneyland have the Nightmare Before Christmas Holiday Mansion overlay. 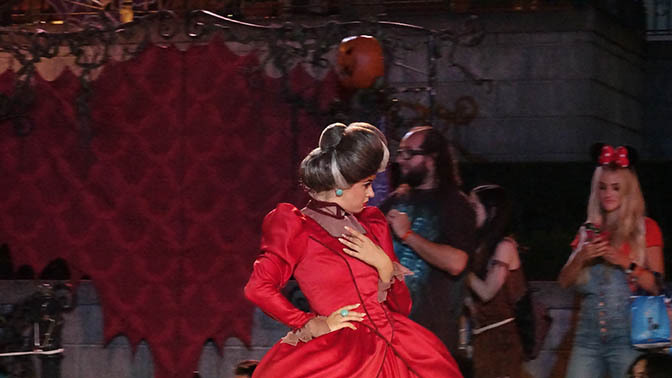 Admittedly, this isn’t just during the Halloween Party. Correct. 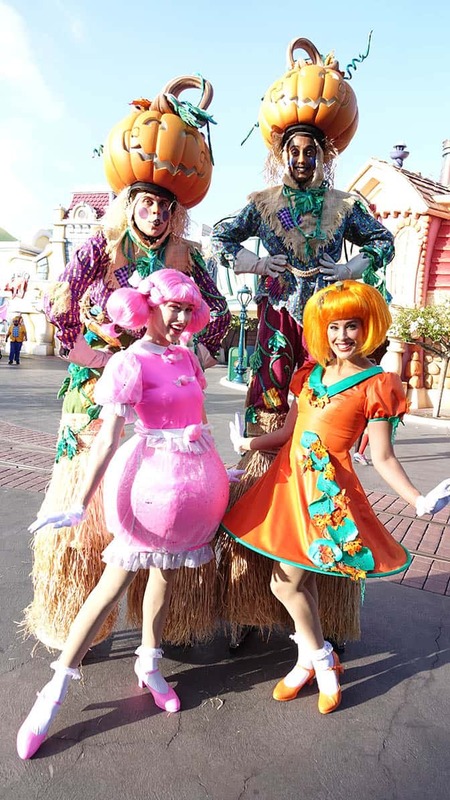 That and variety of Halloween characters leads me to DL and DCA during the daytime. Party isn’t worth the cost with all the cuts the last two years. 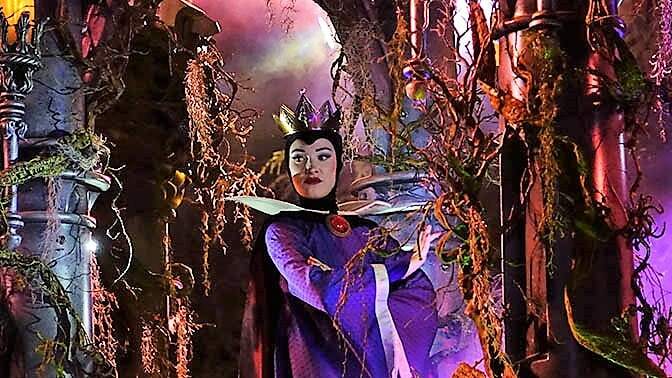 2017 I’d choose WDW. 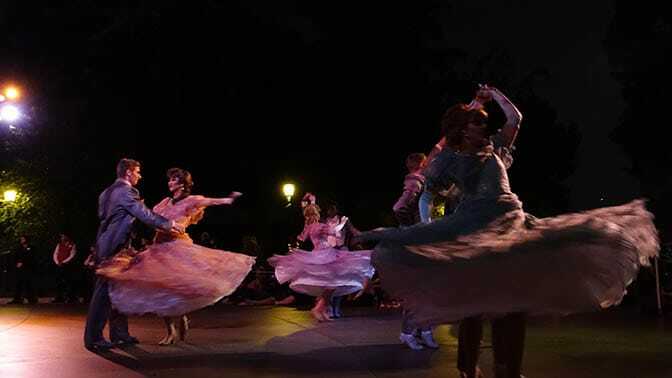 More to see and do here and less congested. 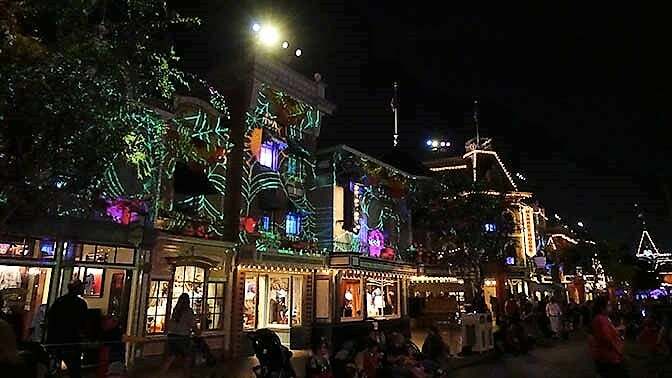 I’d visit DL during the day though.